Universality Ethics and International Relations introduces students to the key debates about ethics in international relations theory. This book explores the reasons why grappling with universality and ethics seems to be a profound endeavour and where we end up when we do. 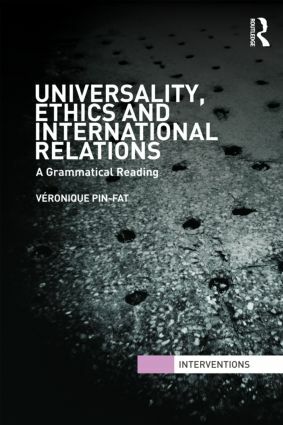 By offering a new way of thinking about ethics in International Relations, Pin-Fat shows that there are several varieties of universality which are offered as the answer to ethics in global politics; the divine universality of Hans Morgenthau, the ideal universality of Charles R. Beitz and the binary universality of Michael Walzer. Taking the reader on a grammatical odyssey through each, the book concludes that profound searches for the foundations of universality can’t fulfil our deepest desires for an answer to ethics in global politics. Pin-Fat suggests that the failure of these searches reveals the ethical desirability of defending universality as (im)possible. An ideal text for use in a wide variety of courses, including ethics in international relations, international relations theory, and international political theory, this work provides a valuable new contribution to this rapidly developing field of research.